On November 20th 2016, USk Chicago met at the Garfield Park Conservatory. We had a great turnout of sketchers. 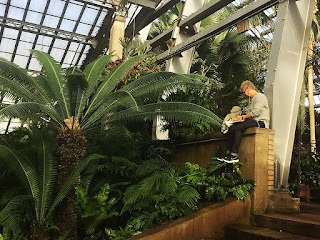 I think that we all would agree that this mega greenhouse was the place to be during this cold November day. 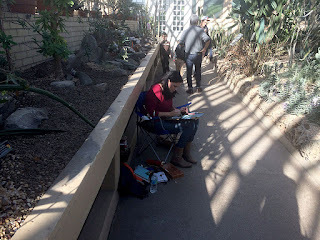 The "Desert House" seemed to be very popular due to it's warm but dry conditions (also good for drying watercolor paint). I'm sure we'll be back again. Here are a few photos from the outing. 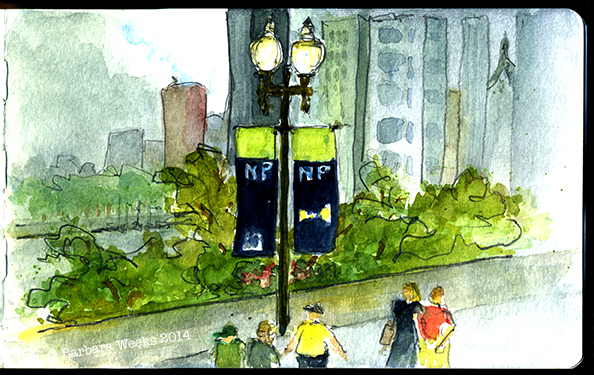 USk Chicago Sketches in "The Loop"
On October 29th 2016, USk Chicago sketched in "The Loop". Blick Art Materials, one of our group's sponsors generously hosted us at their Loop store location, and provided us with space to share our sketches, to enjoy refreshments, and to participate in a gift card raffle. The group gathered inside the store for a brief introduction to the Urban Sketchers group. 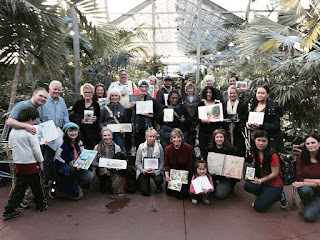 We were happy to see many new sketchers join us and to be able to introduce them to our group. 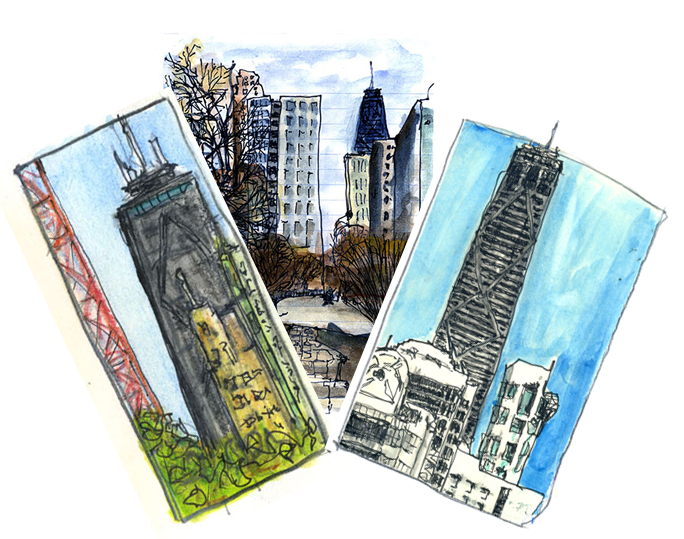 Sketchers then spread out throughout the Loop and sketched at sights from Millenium Park, to the Riverwalk to all different architectural landmarks on surrounding streets and plazas. 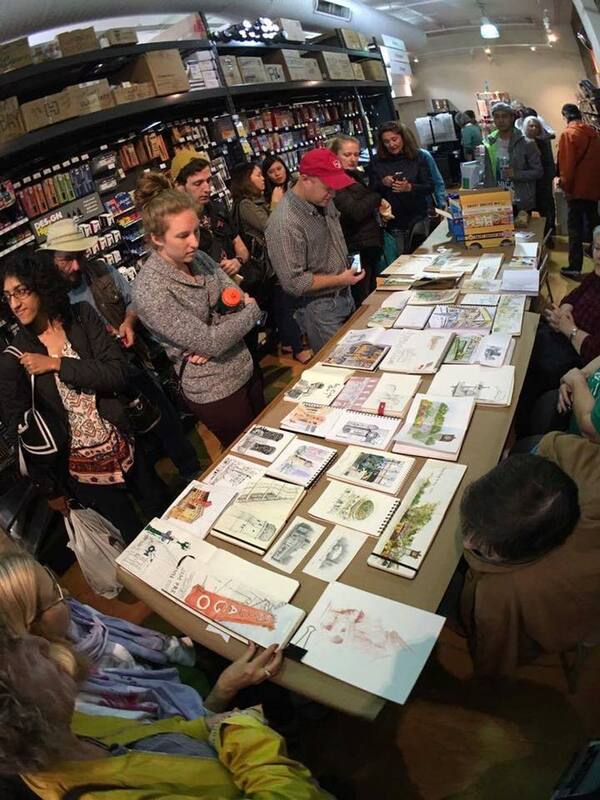 We gathered back up at Blick Art to share our work, and were impressed with such a great turnout. 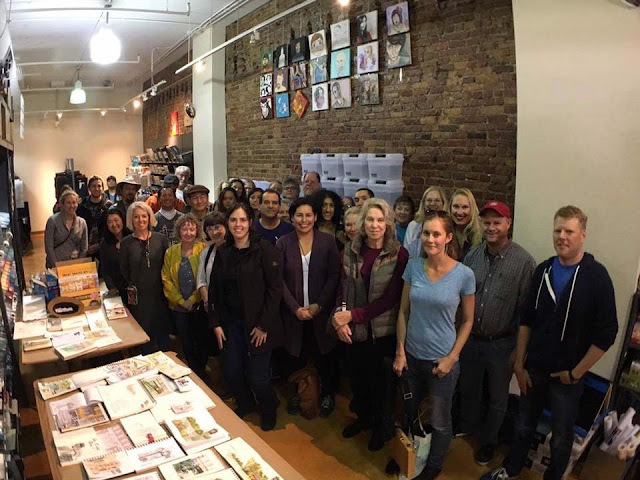 Thank-you to all who came out, to Blick Art Materials for hosting us and to Fernanda Vaz for joining us all the way from Brazil for preparations for the 8th annual 2017 International Urban Sketchers Symposium, which comes to Chicago in summer 2017! See more pictures from the event on our Facebook Page. 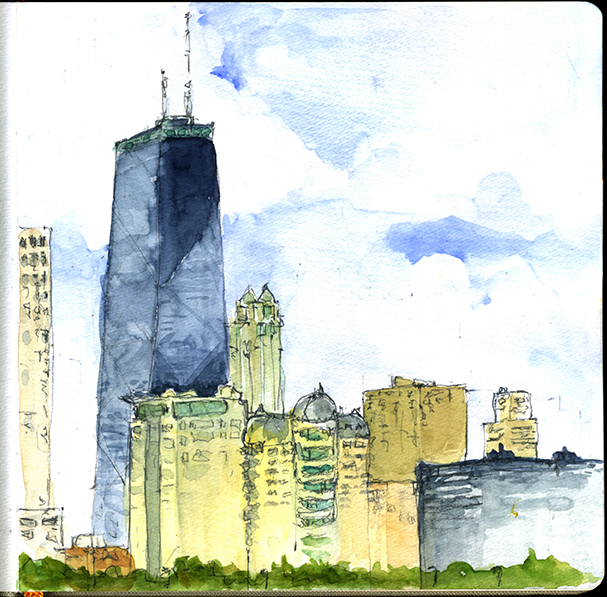 Make sure to "like" the page to stay up to date with the group and for announcements regarding the 2017 International Symposium #uskchicago2017. 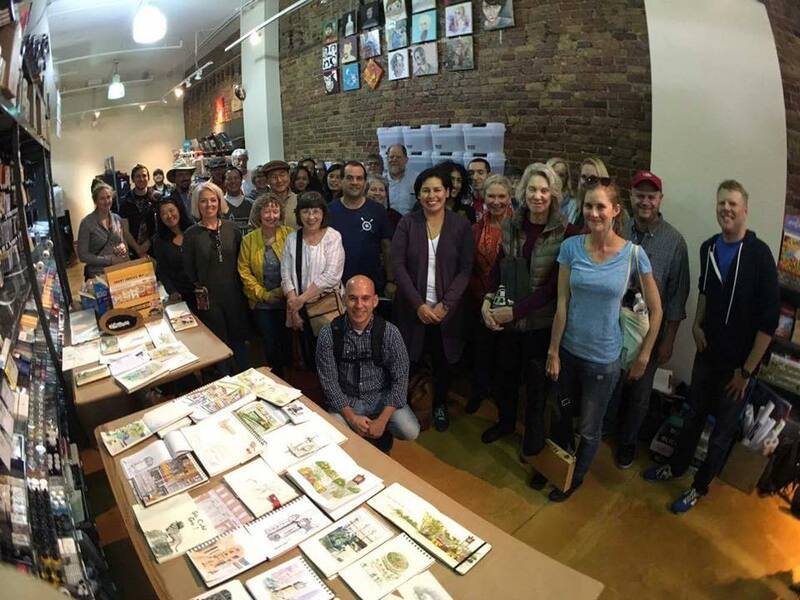 Urban Sketchers Chicago is excited to be hosting the 2017 Urban Sketchers 8th Annual Symposium. 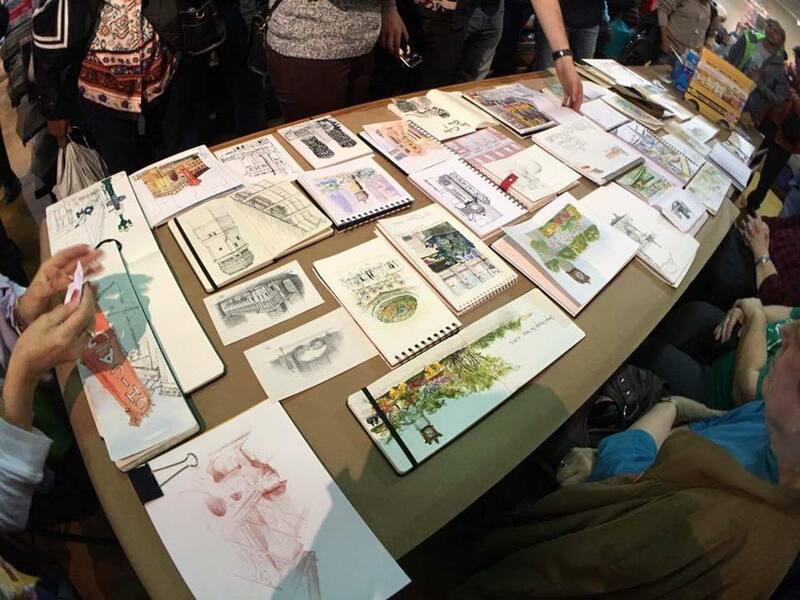 We'll be welcoming over 450 urban sketchers from around the world to meet, sketch, and share our city! 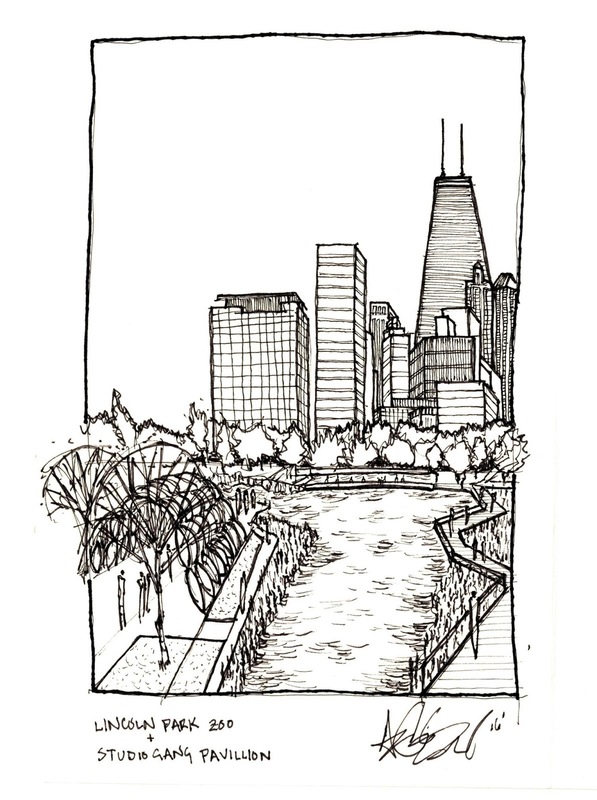 As a teaser of all the sights in store for you next year, over the next few weeks, we'll be sharing some of our sketches (both new and old) of our beautiful, diverse, and exciting Chicago. 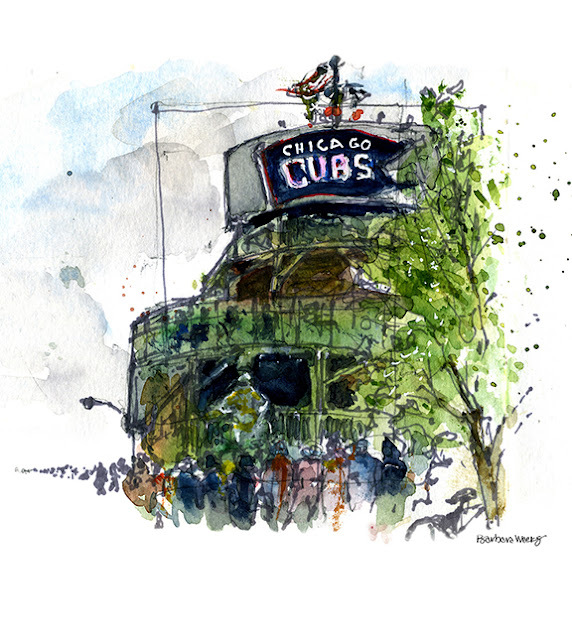 First of all – Congratulations Cubs! Chicago is sports. I must add a W flag remarque to this print! You name it Chicago has it and then some! Sports, music, art, iconic architecture, Lake Michigan, pizza, hot dogs, gourmet food, parades, history and on and on and on! Most of all for me, Chicago is a great place for Urban Sketchers to show the world one drawing at a time! 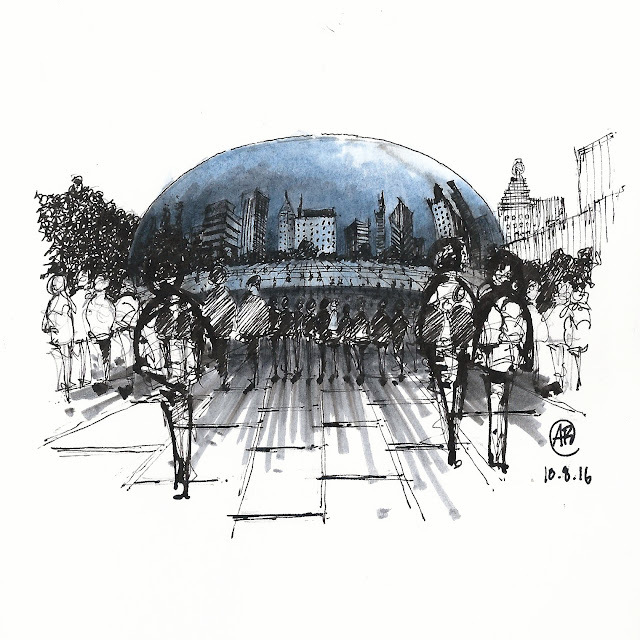 Urban Sketching at "The Bean"
Even after having lived in Chicago for 6 years now, urban sketching has kept all of the "touristy" places in Chicago intriguing and enjoyable for me to visit. I've sketched here before, but there is always new inspiration for capturing it differently than before. I've found that as my skill sets develop, and as I continue to explore different media, there is always some new or improved way of seeing and representing a scene. 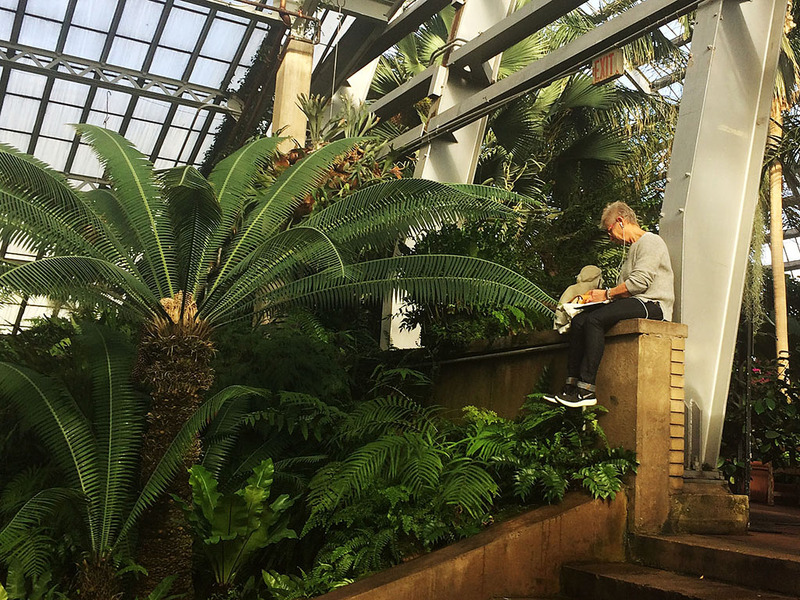 These iconic spaces, structures and views aren't recognized around the world for no reason. If you have even have the smallest interest in design, art, or architecture, it will be hard not to have a great time in Chicago. This sketch took about 45 minutes, and as I sat on the ground, on a particularly busy day at The Bean, I had the chance to chat with several people who were interested in what I was working on. I always enjoy sharing my work, and popular public places like this are great for introducing people to your work and to the Urban Sketchers community. There's always something new to learn! I spent Saturday in Chicago's Ravenswood neighborhood at the workshop "FEARLESS Sketching in Pen, Ink and Watercolor with Adriana Gasparich." What a fun day! The workshop was held in Ingrid Albrecht's studio in Ravenswood. As an artist, no matter how much experince I have or how much I know (or think I know) there's always more to learn. That certainly was the case last Saturday. Thank you Adriana and Ingrid for an inspiring, friendly and encouraging day! These sketches were done in a Stillman & Birn Zeta Series sketchbook. I'm looking forward to the wealth of knowlege coming our way at the Symposium next summer! The Hancock Tower is the fourth tallest building in Chicago and surely one of the city's architectural icons. I don't know if it's one of my favorite building to draw, but from the number of times I've sketched it, it sure calls out to me. Though sometimes it plays hide-and-seek, it's always there for me to draw. It's my directional beacon. It's also my neighbor, greeting me when I look out the window. It's always there, calling me home. The Art Institute of Chicago's famous western entrance on Michigan Avenue is guarded by two bronze lion statues created by Edward Kemeys. The lions were unveiled on May 10, 1894, each weighing more than two tons. The sculptor gave them unofficial names: the south lion is "stands in an attitude of defiance," and the north lion is "on the prowl." When a Chicago sports team plays in the championships of their respective league (i.e. the Super Bowl or Stanley Cup Finals, not the entire playoffs), the lions are frequently dressed in that team's uniform. Evergreen wreaths are placed around their necks during the Christmas season. Funny thing about sketching Chicago architecture: you sketch it once and you feel pretty good about it until months or years later, when there's a voice inside your head that says "Let's try that again." And that is why you see two renditions of the same defiant lion. 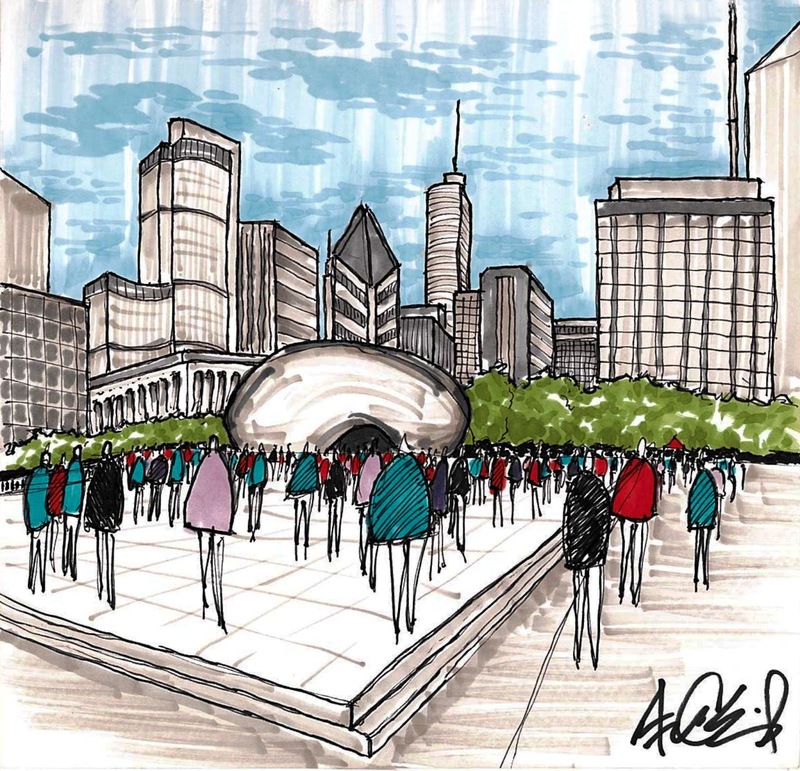 Are you up for a big Urban Sketchers Chicago Challenge? Are you up for a big challenge? The Chicago Architecture Foundation’s Open House Chicago (OHC) is the city’s annual architecture festival. For one weekend, October 15-16, 2016, you can explore Chicago’s most iconic and unique architectural treasures. From mansions to sacred spaces, theaters to private clubs, hotels to secret rooms—OHC gives visitors a behind-the-scenes look at many of the city’s great spaces that are rarely, if ever, open to the public. 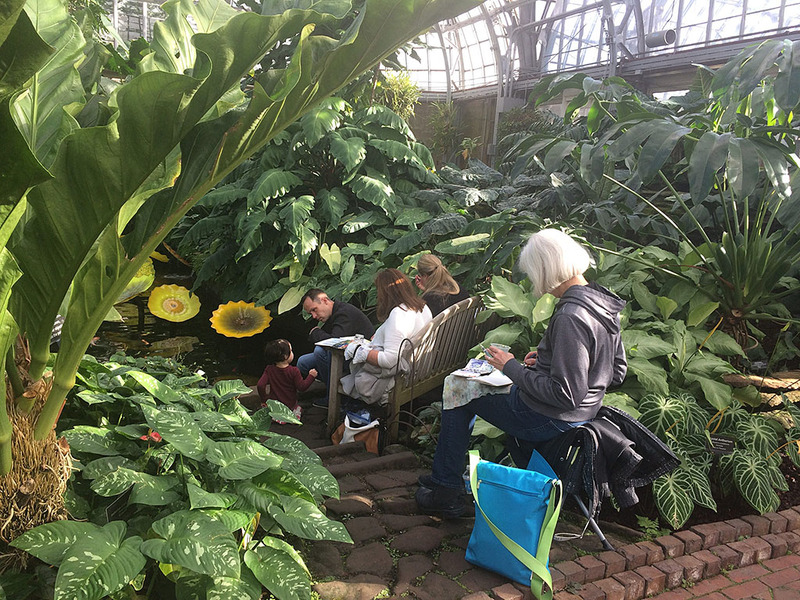 Here’s your chance to venture into new neighborhoods, learn the stories of Chicago’s buildings and experience the diversity and culture of each community. If you are looking for an excuse to visit Chicago and want to see our city's best architecture spaces, this weekend is highly recommended. OHC is completely free-of-charge—no registration or tickets are needed. So gather your friends, plan your itinerary and mark your calendar for October 15-16, 2016! In the past, Urban Sketchers Chicago has organized our October monthly Let's Sketch events around this phenomenal opportunity to see the city's most inspiring and impressive architecture. 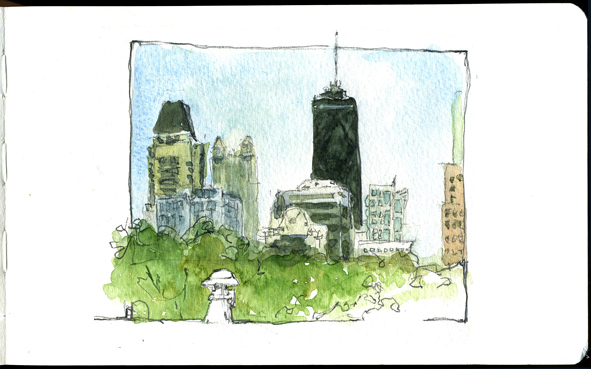 In our typical format of the "3-hour sketch crawl window," the USk Chicago organizers had taken the liberty to pick out two or three buildings in which to tour but miss out on the other 150 or so equally impressive buildings. 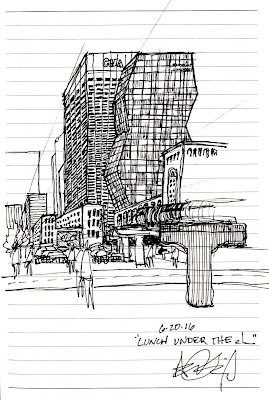 This year's Urban Sketchers Chicago Challenge: I wonder what would happen if I challenged Urban Sketchers to "divide and conquer" as many buildings on your own (or with a sketch buddy) and share your sketches in the Urban Sketchers Chicago Facebook, Twitter, Instagram and Pinterest groups (whichever is your social media preference). 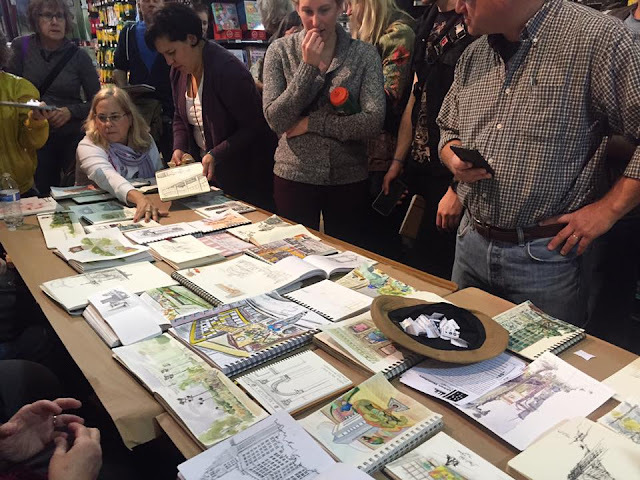 Add these hashtags (#OHC2016 #uskchicago #urbansketchers) in your descriptions when posting your sketches so that we can find all of your wonderful impressions of the CAF Open House. Glorious autumn day at Navy Pier, even though a boat docked and blocked my view! Chicago's Chinatown is easily accessible with many forms of public transportation and my favorite mode is the Chicago Water Taxi. There is something relaxing about taking a boat ride on the South Annex of the Chicago River to arrive at this bounty of color and detail. It is not the same as riding a San-Pan in China, but equally as nice. Arriving at the Water Taxi stop in Chinatown sets you at the doorstep of Ping Tom Memorial Park and a dramatic red and yellow pagoda-styled pavilion. I was immediately captivated by the graphic nature of the lines, curves and exquisite details of the tiny dragon figures located on each apex. If sketching plants and foliage is your thing, then you have to check out this one-of-a-kind dwelling so covered with vines that it should be called a tree house. Located just steps from the Ping Tom Memorial Park and a sight to see in person. 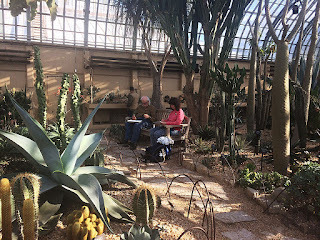 Urban Sketchers –Meeting, Sketching, Sharing in Chicago! 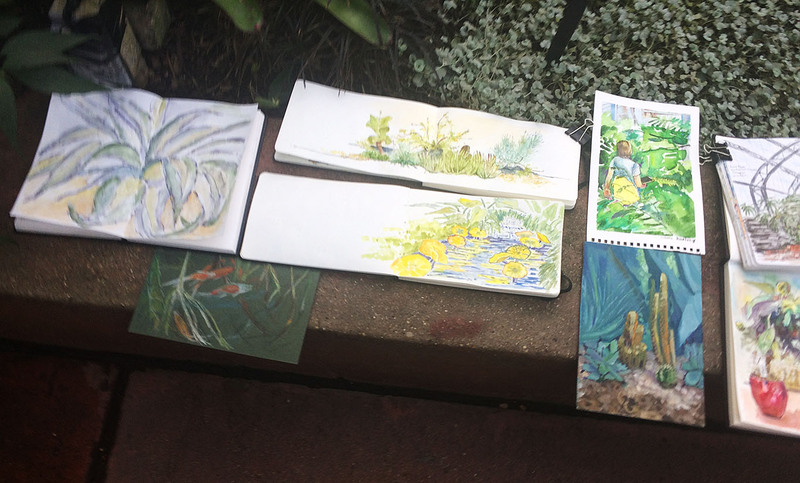 Recently, I was going through some old sketchbooks and found myself saying over and over, "Oh, that's one of my favorite places to sketch!" 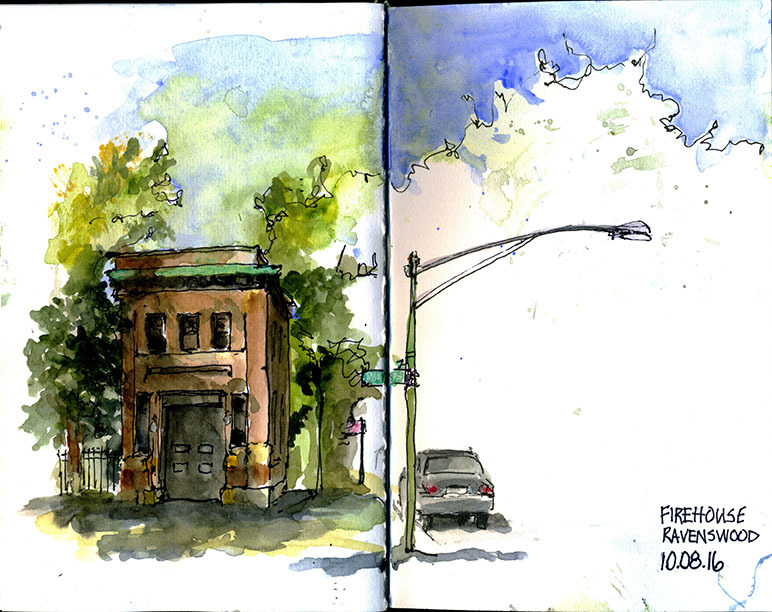 Then it dawned on me, I love sketching in Chicago – anywhere. I hope you will, too. Spotlight Sunday is a series of interviews designed to introduce and highlight Chicago Urban Sketchers individually. Now that our chapter has over 500 members it has become more of a challenge to meet every sketcher in person and have a conversation. These posts concentrate on individuals and speak in their own words and sketches. Hi Aaron, thanks again for taking the time to be this week's spotlight feature and for sharing a little bit about yourself with the group! Andrew Banks: How did you first hear about the Urban Sketchers community and what made you decide to join Urban Sketching Chicago? 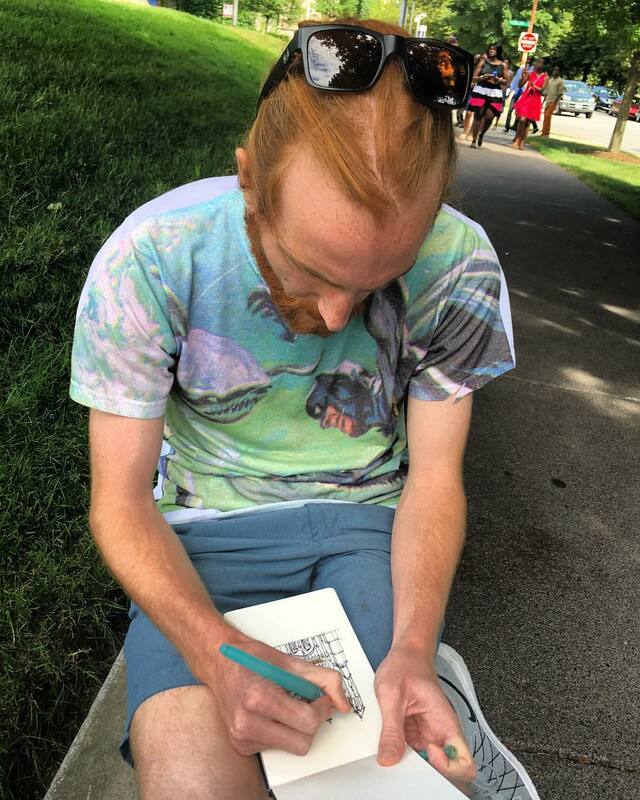 Aaron Elswick: A couple of years back I was sketching commuters on the Metra and I ran into Peggy Condon. 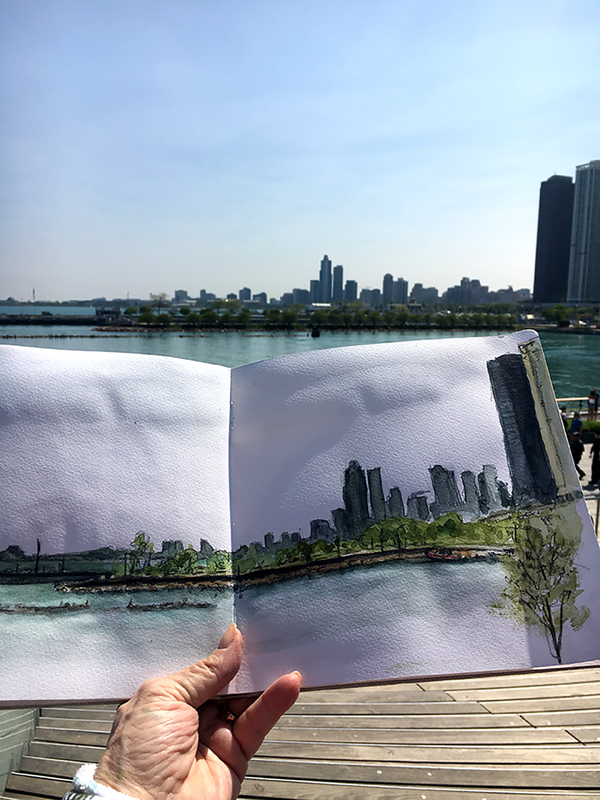 She noticed what I was doing and suggested I join Urban Sketching Chicago. Until then I thought I was the only weirdo that did this. Andrew: That's awesome. I always enjoy hearing about how people find out about the group. Sometimes it's through our social media accounts, or through a Google search, but these in-person introductions are always the most memorable. 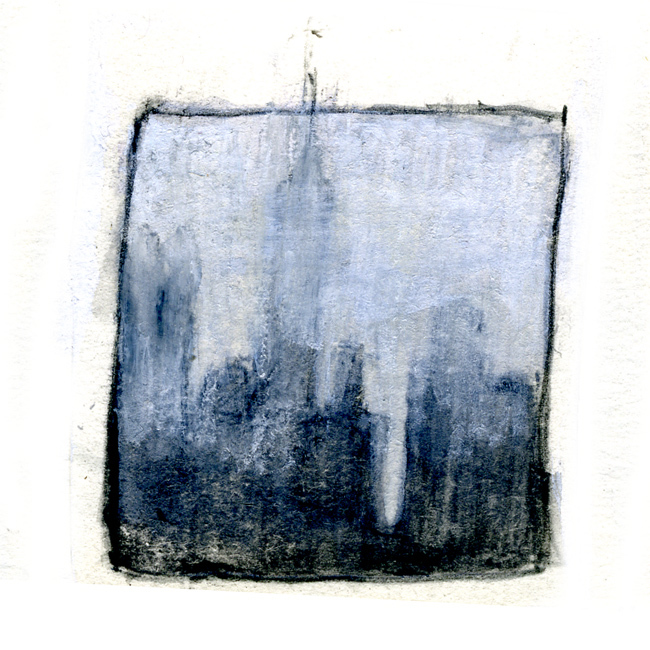 Andrew: Did you sketch before finding USk Chicago? If so, when did you start sketching? Aaron Elswick: I have drawn and painted most of my life. My primary subject matter has always been sharks (most often drawn from reference photos). 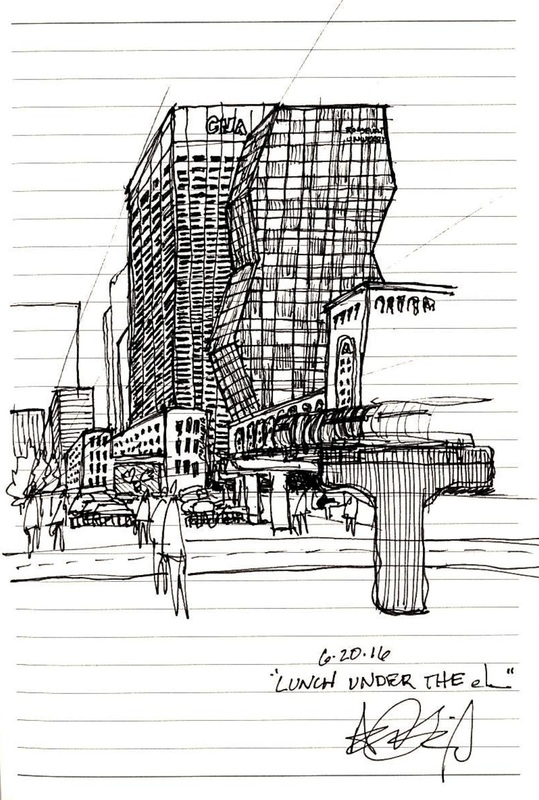 I began sketching on location a little over 3 years ago to become a better urban designer. It was the summer before I started my Masters of Urban Design and I didn’t know much about architecture at the time. I decided going out and drawing architecture would be a great way to learn what I could before school started. During this same period of time I was interning as a landscape architect. I noticed that my boss – the lead designer – was always the one drawing throughout the design process. I realized that summer that if I ever wanted to be the one drawing (and I did) I was going to have to draw as fast and legibly loose as my boss did when creating (her “cartoons,” as she calls them). Andrew: Can you tell us a little bit about your background? 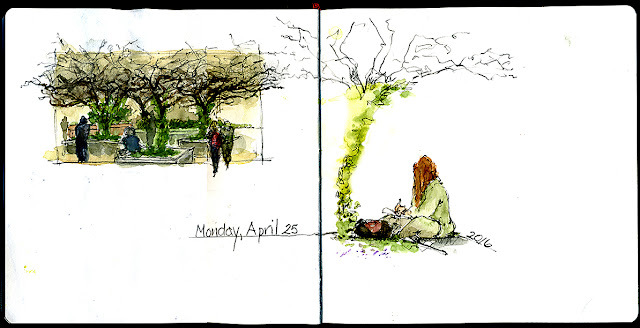 Does urban sketching ever have an impact on your day job? If so, how? 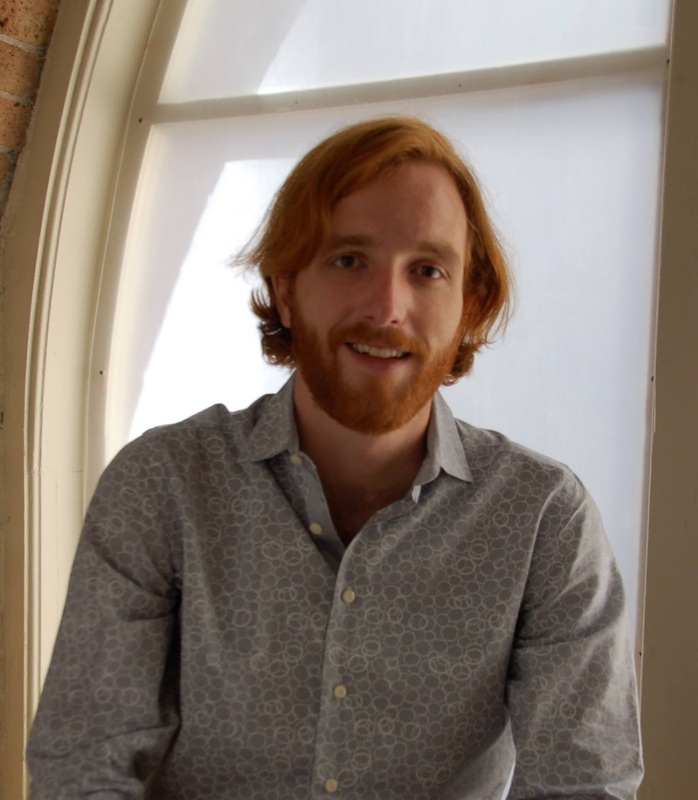 Aaron Elswick: I have a professional degree in Landscape Architecture from the University of Kentucky and a Masters of Urban Design from the Savannah College of Art and Design. I am presently employed as a Site Architect at Terry Guen Design Associates, a local landscape architecture and urban design firm. To explain what we do as simply as possible I like to say: "If you’re not standing inside of a building, then you are standing in exactly what we do." At TGDA we call this “Design for Life,” viewing our work as the backdrop, or stage, for the play of life to unfold. Our objective with every project is to design a sustainable environment that allows for the most acts of the play to occur, be it social, environmental, or economic. 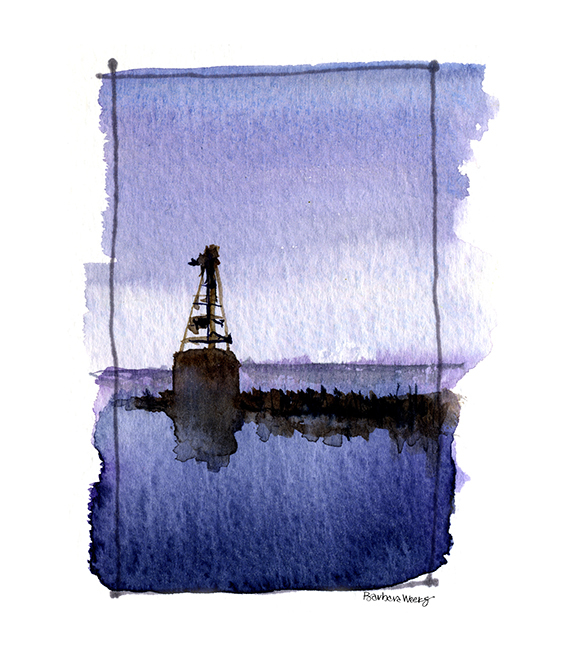 Urban sketching is the foundation of my design process and on a daily basis it helps me imagine, draw, and design for the future. 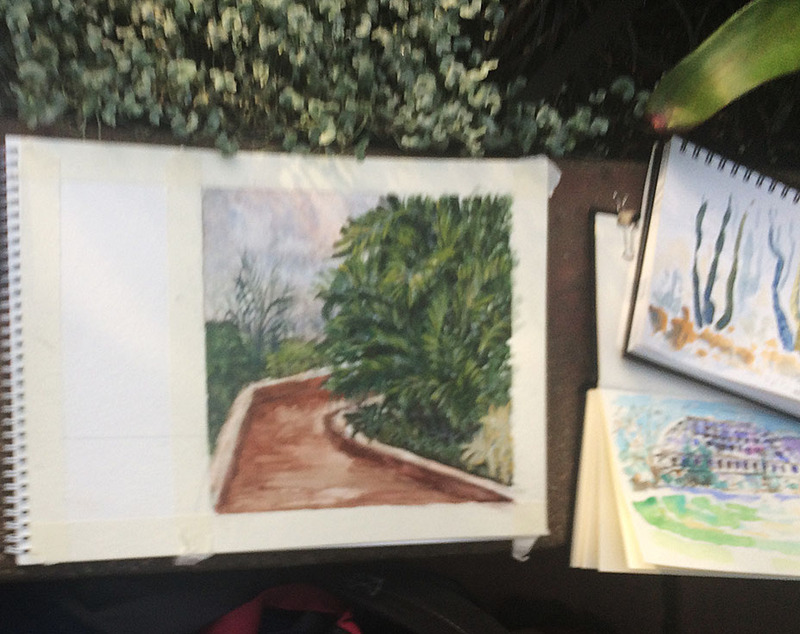 When I am sketching on location, I am analyzing the proportions, textures, scale, and context of the objects that define a place and simplifying it all to just a series of lines. 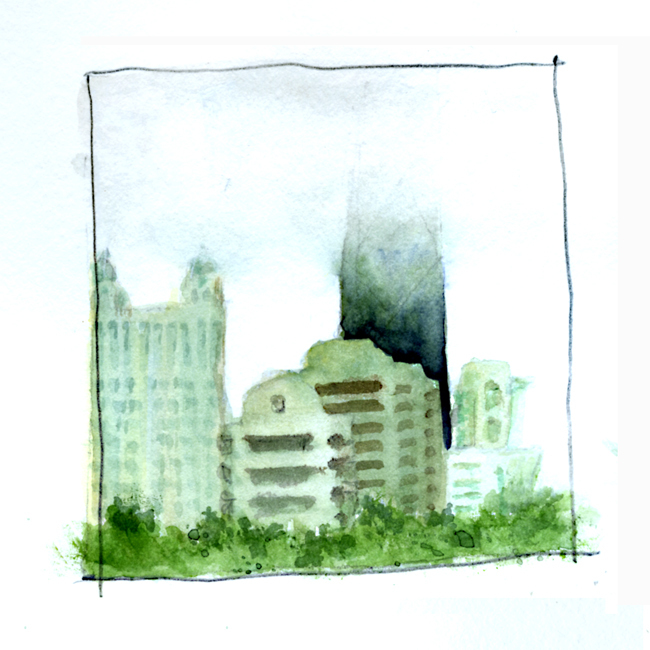 As a Site Architect, I use my urban sketches as a mental reference bank to draw and design a city. Drawing is a tool and the language that I use in my career to communicate and explore ideas. Although drawing is only a tiny piece of my career, it is easily one of the most critical assets of my design process. 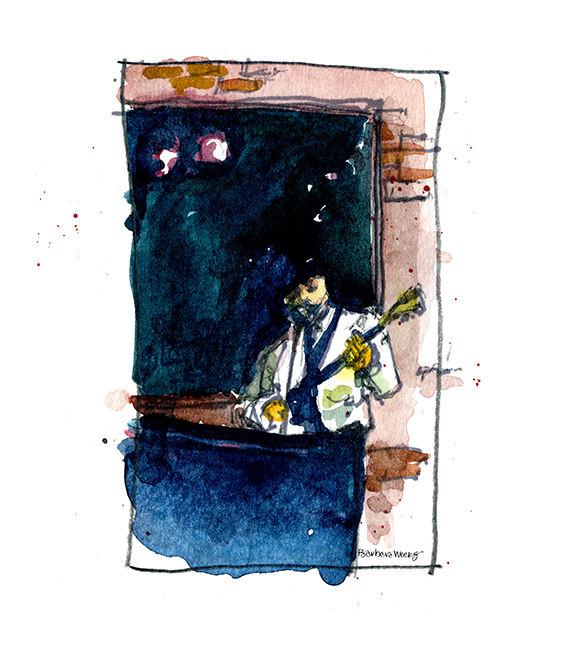 Urban sketching is how I practice, learn and explore topics related to my profession. 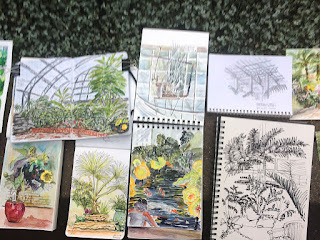 The two most valuable lessons I have learned professionally, via sketching on location, is to be unafraid to fail and that the ugliest sketch is better than no sketch at all. A mentor of mine once broke it down to me like this: the best designer is the one who is least afraid of failing. 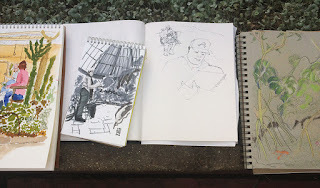 Before I started urban sketching I only wanted to show people perfect drawings, but I have learned that this hinders the design process and restricts the flow of ideas. Loosening up a bit and focusing on conveying an idea, as opposed to seeking perfection has been a real turning point in my career. Being unafraid to fail has gotten me to the “design table” at a very early in my career. 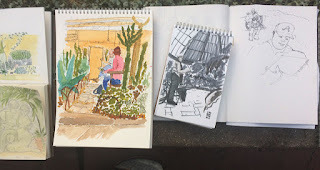 I credit joining Urban Sketchers Chicago and its community for giving me a space to explore this practice and learn the truth in the advice I’ve been given. Andrew: Wow, that's so awesome. Your response is not only inspiring and challenging, but also a great reminder to me (and I am sure others as well) about what urban sketching is all about. 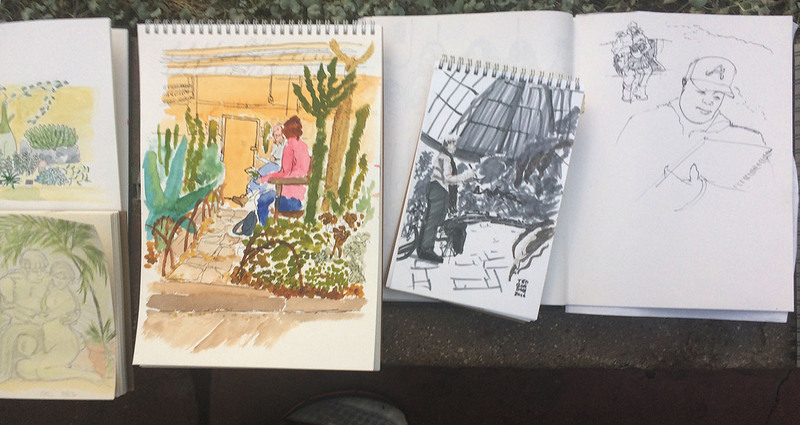 It really sounds like urban sketching is intertwined with your day to day professional work, and is giving you some great opportunities for creative expression and experimentation all at the same time. I really like what you said here: "the best designer is the one who is least afraid of failing. 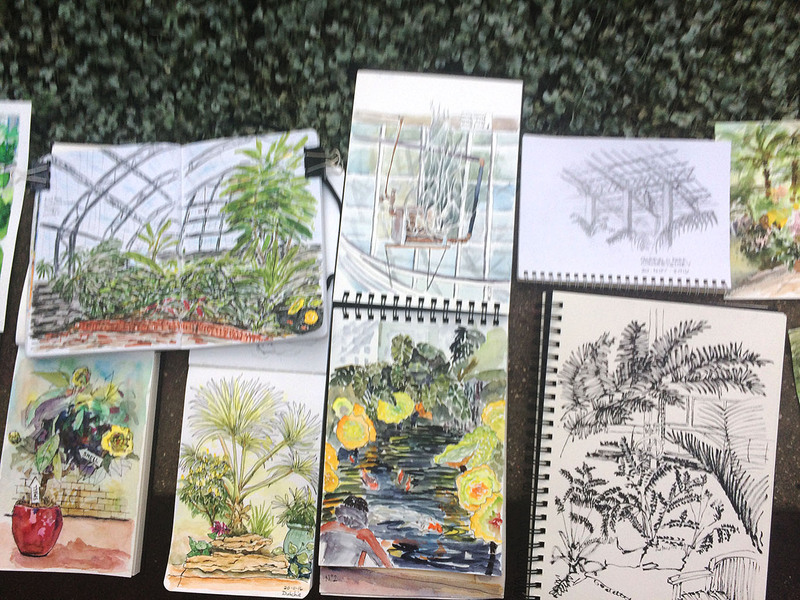 Before I started urban sketching I only wanted to show people perfect drawings, but I have learned that this hinders the design process and restricts the flow of ideas. Loosening up a bit and focusing on conveying an idea, as opposed to seeking perfection has been a real turning point in my career." I really think that every single person in our group will benefit from that advice. I know I already have. It's so easy to get critical of our own work, wondering whether it's worth sharing or not. But when we start holding ourselves back or aiming for some standard of perfection we lose out on a lot of creative opportunities. 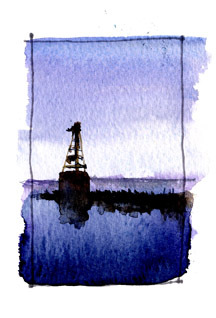 Andrew: Is there a specific subject matter you are particularly drawn to or inspired to sketch? Aaron Elswick: I am most attracted to iconic facets of Urban Design – buildings, public spaces, infrastructure, streetscapes, and everything else in a city. I like to capture the whole scene and believe in going big or going home. The public realm is my home and I firmly believe that people define great places and not buildings or landscape architecture. Therefore I am commonly sketching in a crowd or in places people choose to spend their leisure time. Doing this enlightened me to the extremely social aspects of urban sketching, which is now is my favorite part. I love the Q&A sessions, exchanging of stories, and impromptu workshops that sketching on location facilitates. 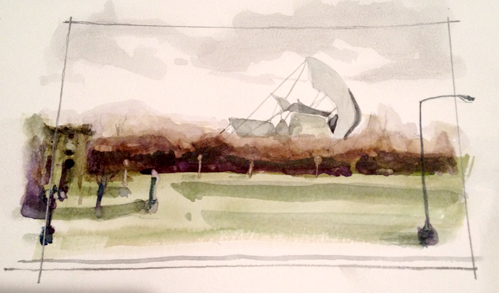 Occasionally, I want to sketch from a distance and tend to choose public parks. However, I rarely ever sketch a singular object. For me and what I do, context is everything! Andrew: What is your favorite medium to sketch with? Aaron Elswick: My favorite medium to sketch with is 100% pen and ink. A pen tells the truth and the whole story of the sketch. The authenticity of storytelling through my sketches is something I have recently have started to explore. I learned to draw with a pencil, but in my profession pen and ink is the standard for hand graphics. To learn how to draw with a pen, I just stopped taking a pencil and eraser with me. At first this was quite the challenge, but with a lot of practice it is now starting to come more naturally to me. Andrew: The idea of truth and authenticity in storytelling through our sketches is a super interesting topic and I would love to hear more of your thoughts and approach to this sometime. I agree though, there is something really freeing about jumping in to a sketch in ink without any pencil outlines. It definitely forces you to be intentional with each line. I work a lot with ink myself and I like to tell people that while you can't erase ink, it's also a fairly forgiving medium to sketch with if you know how to work with your mistakes and build them into the sketch. 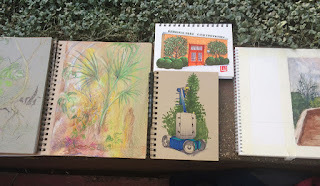 Andrew: Are there any Urban Sketchers who inspire your own work? Aaron Elswick: In all honesty, every member inspires me. Seeing how often people are posting, what they are sketching, and the techniques they are using motivates me to get out there and go do it more often. I believe some members are in a completely different league and/or playing an entirely different game than I am. 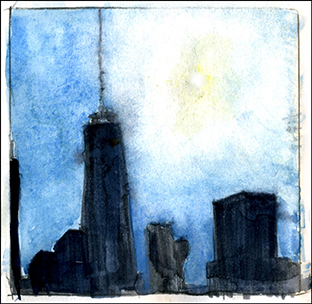 There are two members that really speak to me with their work and influence my sketching: Andrew Banks and Wes Douglas. Both of these guys are absolute masters of their craft. What I enjoy most about their work is the subject matter and their uniquely identifiable styles. Andrew’s hatching and spot on architectural rendering style is extremely impressive. Wes’ diversity of subject matter, techniques, and use of markers is out of this world. 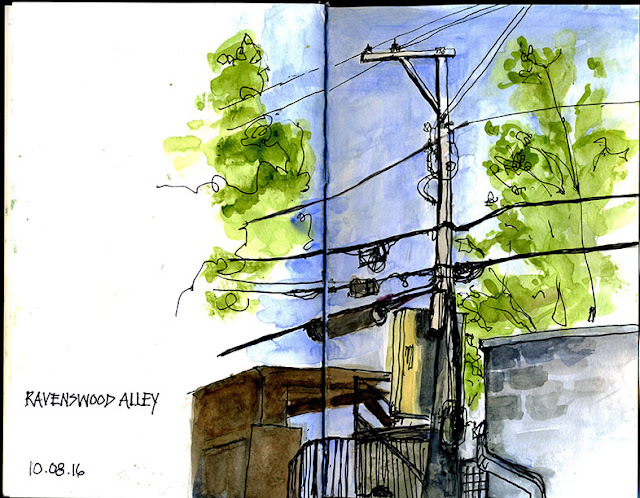 Andrew Banks: That is the beauty of the urban sketching community. There is such a wide range of styles, techniques, view points and skills levels to learn from. There is never a shortage of inspiration to be found, that is for sure. 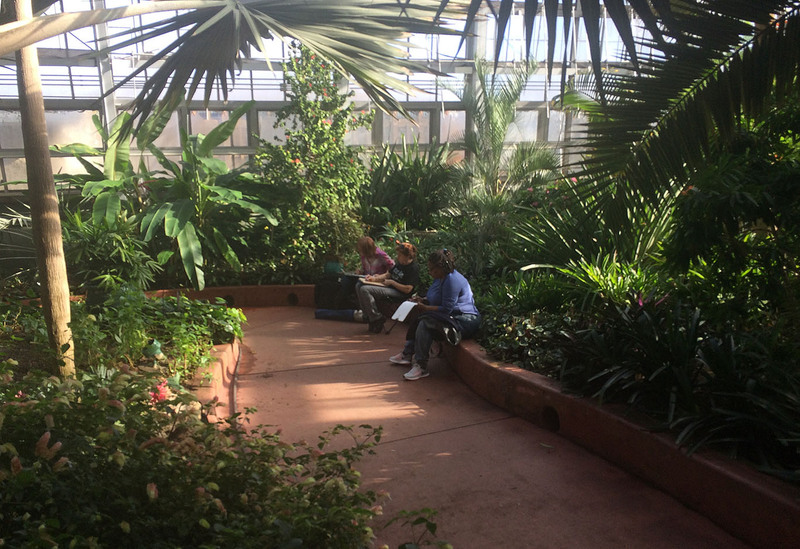 Andrew: If you could choose any location for the next group sketch event, where would it be? Aaron Elswick: Without a doubt I would choose the Shedd Aquarium! Sharks are my weird obsession and I have been drawing them my whole life. 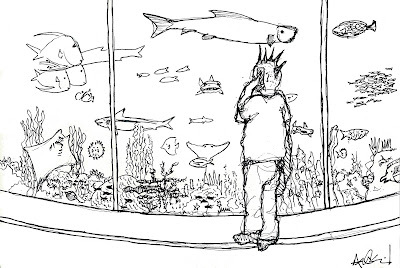 The Shedd would offer a unique opportunity to take a crack at the plethora of subject matter the aquatic environment offers, after all it is pretty hard to draw underwater. 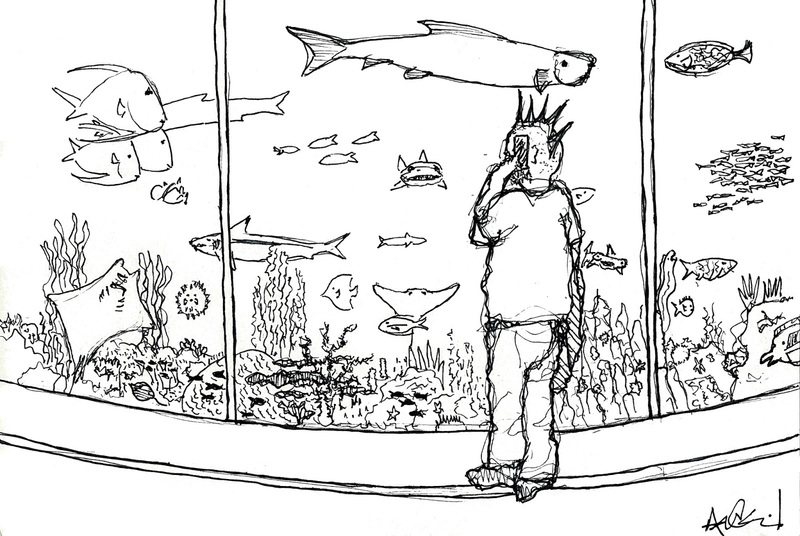 It would be a real treat and I would absolutely LOVE to see how all of the different members of UskChicago depict life underwater. Andrew: Do you have any websites, blogs or social media accounts where people can see more of your work? Aaron Elswick: I am on Facebook and Instagram at the moment. I have a lot of projects in the works and a website/marketplace is in development. Once that all gets launched I’ll be sure to let the group know. Andrew Banks: Thanks again Aaron!